K & R Towing Inc.
K & R Towing Inc has been New Ulm’s most trusted and reliable towing and roadside service provider since 2007. We offer 24/7 availability and short wait times, 365 days per year, and at fair prices. Call us in an emergency for a tow, tire change or jump start! As anyone who’s ever had a flat tire, a dead battery or the experience of their car breaking down in a remote area can tell you, there’s nothing quite like being faced with unexpected car trouble and feeling like you have no one you can call. For residents of New Ulm and the surrounding areas, however, there’s one towing company whose number you ought to save for situations just like these: K & R Towing Inc. 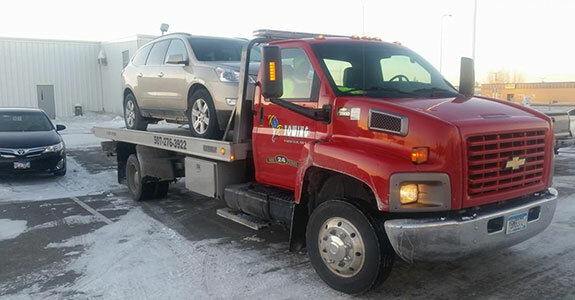 Since 2007, we’ve been the premier towing service in Brown County, MN, offering aid to area drivers who have experienced car trouble within 25 miles of our location. We are a full service towing and roadside assistance company. We have been serving New Ulm and Brown County, MN since 2007. We offer 24/7 services every day of the year. We’re committed to charging fair prices and offering short wait times. Contact K & R Towing Inc in any roadside emergency for fast, affordable and highly professional service.